Create a Google Account by using your WWU email address and a password just for this site (do not use your universal password). For university sites we recommend you use your WWU account, but for personal use tracking your own sites we recommend using a pre-established gmail account or your personal email address. Fill in the rest of the form, including accepting the Terms of Service (Note that WWU’s Purchasing Department has approved this contract). Click Get Tracking ID, accept the terms and Google will take you directly to your tracking code script within your Administration page. Copy (Ctrl-C) this script for use in the next section. For WordPress, go to Dashboard, Settings, Google Analytics and enter the code in the Site Tracking Code area. For Drupal, contact your Administrator. For the Western template, follow the instructions below. Open your site in Dreamweaver (see Dreamweaver Site Setup information). It will take Google at least 24 hours to collect data. Check back the next day to see if the code is working. If there is no data after a few days, check your code to see that it’s in the right place. NOTE: Google Analytics doesn’t collect data retroactively. You will only have data from the day you implemented the code onward. This includes any campaign or event tracking, or filters you would like to implement. For assistance with setting up these features, please contact WebTech and put Analytics Help in the subject line. IMPORTANT: We highly recommend allowing WebTech administrative access to your account. This ensures you will not lose any account information due to lost passwords and/or employment changes and allows our team to better assist you. 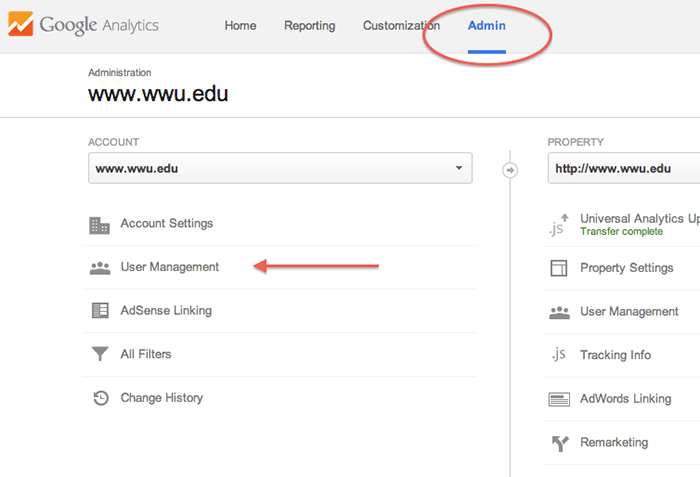 Click on the Admin tab on the right in the navigation bar then go to User Management under Account. Enter an email address such as webhelp@wwu.edu in the Add permissions for box. For webhelp and other power users, select all check boxes in the Manage Users area so that these people can assist in managing and editing status. For those that you just want to see the data, not manage users, select Read & Analyze only.